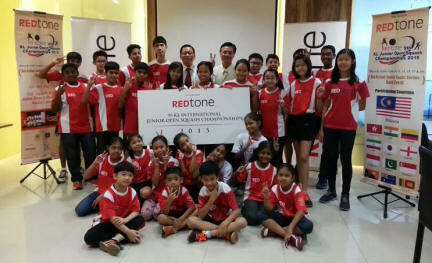 REDtone KL Junior open ended with some spectacular finals especially the boys under 17s and girls under 19s final. The morning started with the younger age groups and a very competitive boys under 9 age group was won by Abdul Fahm Bini Abdul Basir in three games with a win over Kuhen Ravendran. In the girls under 9s it was won by Sashmini Chandran after she defeated top seed Parmin Nekopaeian from Iran in the final. The best thing about watching the under 9s is that it is so fair and the players play with a smile on their face. Sehveetrraa Kumar ended the run of Nur Maisara in the final in three games with both of them looking promising players for the future. Pakistans Huzaifa Ibrahim showed why he was top seed with a three game victory over Levinesh Prakash but a couple of the games were only won by two points. Wong Heng Wai finally turned the tables on Kiroshanna Manoharan after losing three major finals recently to Kiroshanna. Heng Wai played at high intensity and never really allowed Kiroshanna to work her way into the match. Mohammed Amir Amirul looked in good shape before his assault on the British Junior Open in a months time with a win over Iranian Danial Gharouni in three games. Jessica Keng the current British Junior Open under 13 champion wasted little time adding to her list of achievements defeating Nurul Izzah in three games. Danial Nurhaqiem beat his training partner Hafiz Zhafri in five close games. The opening four games were shared with one player dominating then the other one. In the fifth game Danial got the better start making it hard for Hafiz to close up the gap on him. Aifa Azman won two tight opening games against Nur Aliah before winning the third game comfortably. The boys under 17s match was the first of two classics. Eugene Heng completed a good week with a 13.11 win in the fifth set against top seed Alireza Shameli. In the fifth game both players had chances to clinch the title but it was Eugene on his second attempt that managed to win the title. The next final was just as dramatic as the boys under 17s final, in the girls under 19 event with Andrea Lee managing to retain her title. Just as she won in a tie break in the fifth last year it was the same this year with another tie break win in the fifth but this time she had to come from behind against Japans Satomi Watanabe. In the fifth game Satomi built a lead of 10.6 and looked like she was going to carve her name on the trophy but Andrea had other ideas winning the next six points to retain the title. The last final of the day was between Sajad Zareian of Iran and Ryunosuke Tsukue of Japan, a similar story to the girls under 17s final with the opening two games being quite tight going the way of the Japanese player. A tired looking Sajad now took to the court needing three games for victory but Ryunosuke quickly established an 8.0 lead and quickly made it 11.3. Tournaments cant run themselves they require a lot of work and sacrifices from a lot of people. REDtone as title sponsors need to be thanked for their continued support over the last couple of years. The exceptional work of the organising committee to host 610 players on a circuit format needs to be applauded. All the help of the referees that sit and watch matches endlessly making sure that the tournament runs as smoothly as possible. The Bus drivers that have helped transport all the players around for the last week. All the VIP’s that came because of their love of the game and their willingness to give up some of their time to hopefully witness the next generation of World Class players. REDtone KL Junior Open 2015 saw all of the top four seeds progress in the under 19 age groups all with 3.0 wins. That should set up some good clashes for tomorrows semi finals especially on the girls side. Top seed Nazihah Hanis will face Sri Lanka’s Bronze medallist from the Commonwealth Youth Games Methserani, while in the other semi final it will see Nazihah Hanis playing Japan’s Satomi Watanabe. In the boys under 19s local interest was left after Alwinn Chai and Aqif Ampandi both lost out in the quarter finals to the top two seeds. Alwinn was defeated by top seed Sajad Zareian and Aqif lost to Ryunosuke Tsukue both in three games. In the Girls under 17s the top four seeds won through to the semi final, Aifa Azman shared the opening two games with Chan Yiwen before upping the pace to win the next two sets. In the next quarter final with the match at one game all between Lai Wen Li and Ooi Kah Yan, Kah Yan twisted her ankle in the back corner and was unable to continue the match. In the lower half of the draw Nur Aliah defeated Brodie Tsen in three games and Cheng Nga Ching won the all Hong Kong affair in three games over Tang Yan Yi. Boys under 17s saw the top four seeds progress to the Semi finals but in contrasting styles. Top seed Alireza Shameli and Darren Rahul had convincing wins over their opponents. However in the lower half of the draw Eugene Heng was taken to four games with Siow Yee Xian but the toughest match was between Harley Lam and Wong Peng Soon where Peng Soon fought from two games down to force a fifth but the second seed fought back to maintain an early lead which he had at the start of the fifth. Duncan Lee created the only upset in the boys under 15 age group defeating Iranian Mohammed Rezajaffarzadeh in five evenly contested games. The other three seeds all won through comfortably in three games. Amirah Rusydina created a major upset in the Girls under 15 defeating the top seed Sneha Sivakumar in three straight games. In the boys under 11 Levinesh Prakesh continued his fine form defeating Chris Lau in the semi finals. Levinesh now has one more match left to win to cap a remarkable week, in the final he will face top seed Pakistani Huzaifa Ibrahim after he ended the run of useeded player Veroon Heng in four games. The REDtone KL Junior open entered the third day with the matches getting tougher and tougher at this stage of the event. In the boys under 15 event there were only two upsets to the top eight seeds. Aqif Azahari defeated Vasudef Vasanthan in five games saving match balls in the fourth to progress for a match against top seed Hafiz Zhafri in the quarter finals. The other upset came when Kerwin Teh recovered from a set down to defeat Kiven Shanmugam in four games. Tomorrow Kerwin will play Danial Nurhaqiem for a place in the semi-finals. In the boys under 17 event the only upset created was by Iranian Mojtaba Kafili who won a five game marathon against Daryl Gan. Mojtaba recovered from a set down to win the next two before losing the fourth game 11.9. The fifth was close all the way before Mojtaba managed to sneak it 11.9. In the Girls under 15s event Nur Syarifah continued her fine form defeating Vasundhra Vasanthan in three games setting up a quarter final clash with reigning British Junior Open Champion Jessica Keng. In the Girls under 13s event match of the day was between Nur Waffiah and Yasshmita Jadishkumar where it went to a fifth game and a deciding tie break of 22-20. The top two seeds Kiroshanna Manoharan and Wong Heng Wai look on a collision course to meet in the finals. In the boys under 11 Levinesh Prakash continued his winning ways and progressed to the semi-finals with a win over Eugene Oon in four games. His opponent in the semi-final will be Chris Lau after he defeated Pradeep Prakash in four games. Veroon Heng managed to defeat another seed winning through to the semi-finals where he will face Pakistans Muhammed Ibrahim. The REDtone KL Junior Open for 2015 saw a few upsets created on day 2 as most of the top seeds progressed but a few of the 9.16 seeds were beaten. In the boys under 17 age group William Curtis defeated Sunil Kumar in three games to set up a last sixteen match with Harley Lam after he required four games to defeat Julian Wong. Mivesh Kumar was another player to create an upset when he won 11.9 in the fifth against Colombian Martin Rios. Jesse Foo played well to beat Adam Aziz in five games and he faces his old rival Eugene Heng in tomorrow’s last 16 match after he defeated Singapore’s Ijoe Tan. In the girls under 15s there was a couple of upsets but similar with the other age groups most of the higher seeded players are making it through at the moment. Nur Syarifah defeated Charlize Goh in five games. The other upset was when two team mates clashed Nurul Farzana defeating Wong Heng Ying in four games. The last upset was created by Leoh Liyen defeating Japanese player Ayumi Watanabe in three games. A couple of upsets in the under 13s saw promising player Muhd Fayyad lose out to Singapore’s Edward Thng in a five game thriller. Another five game thriller was the match between Lee Kah Choon and Joachim Chuah which Joachim managed to win in a tie break in the last set. Quite a few upsets in the boys under 11s probably some of the tougher age groups to seed are the younger ones. Second seed Arvin Rasoulzadeh was defeated by Anil Prakash in four games but then he was beaten by Danish Syafiq in four games who in turn lost to Levinesh Prakash in three games. Veroon Heng is the other unseeded player to make the quarter finals beating Japans Yujin Ikeda in three games. The 9th edition of the REDtone KL Junior Open 2015 got underway today at two venues, with the older age groups playing at Bukit Jalil and the younger age groups playing at Jalan Duta. All of the seeds in the boys under 17s matches were in action today but the top 16 players all won pretty comfortably. KL player Afy Luqman needed five games to see of Sabah’s Nicholas Tan with Ngoo Zhan Yew from Malaysia also needing five games to see off Iranian Mazier Hakimi. In the boys under 15 age group all of the seeds won through till tomorrow but a few of them needed more than three games to progress. Kiven Shanmugam needed four games to defeat Justin Ho, with Aqif Azahari and Nicholas Chee needing all five games to see off Dominic Long and Aqif Haikal Shukor respectively. The boys under 13 age group saw only one upset when Cheng Wei Quan defeated Iranian Amir Hossein Sadeghkhani in five games. Lee Yi Guan was the other seed that was tested but managed to survive a five game thriller when he defeated Singapore’s Josiah Chong. Tomorrow will see the matches become a lot tougher as most of the seeded players will be entering into the event or face tougher challenges. The REDtone KL Junior Open in 2015 will become the biggest Junior event in the World so far with 608 players representing 13 countries. There will be two venues in use to accommodate all the players, Bukit Jalil hosting the older age groups and Jalan Duta hosting the younger age groups. There will be 12 titles up for grabs as the competition runs from under 9s to under 19s. Reigning Asian Junior Champion Andrea Lee will be looking to retain the title that she won last year but should face competition from team mate Nazihah Hanis and Japan’s Satomi Watanabe as well as Sri Lanka’s Methsarani. Iranian Sajad Zareian will look to win the Boys Under 19 title for the first time but there will be a lot of competition especially from Japan’s Ryunosuke Tsukue the talented player from Japan who has the abilities to cause problems. Aifa Azman will be the top seed for the Girls under 17s competition and should face similar competition from the people that she needed to beat to win the under 15 event last year. Nur Aliah, Lai Wen Li as well as Chan Yiwen and Ooi Kah Yan have the ability to spoil the show. Hong Kong Cheng Nga Ching could cause a few problems as well. Alireza Shameli will be the top seed for the boys under 17 event as he was last year but he couldn’t quite win the title last year will he be able to do it this year. Harley Lam will be seeded two but locals Eugene Heng and Darren Rahul could cause a few upsets.